A great patient experience begins with ultimate comfort. Our products ensure you and your staff can continue providing exceptional care while increasing patient satisfaction. Improve Patient Experiences. Increase Satisfaction. As a nurse leader, you’ve dedicated your life to not only helping treat patients, but to driving your staff to succeed. For hard working healthcare professionals like you, choosing top quality, trustworthy products and devices is crucial. Today, a positive patient experience is more important than ever before. With patient satisfaction back on the national radar, it’s up to you and your staff to offer best-in-class care to each and every patient. Gebauer’s Patient Comfort Solutions ™ allow you to provide a positive experience without sacrificing efficiency. Save time, reduce pain faster and increase patient satisfaction with the patient comfort products nurse leaders trust most. Healthcare professionals have trusted Gebauer Company’s Patient Comfort Solutions for more than 100 years. Our instant topical anesthetic skin refrigerants work immediately, so patients can undergo procedures quickly. We offer a variety of products to meet hospital regulations, including non-flammable solutions. Gebauer’s instant topical anesthetics are simple to implement and make a lasting impact on patients. Our products are clinically proven to be safe and efficacious. 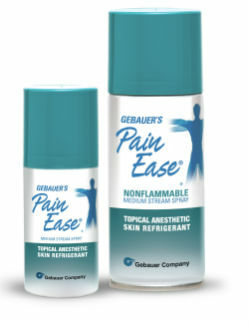 Gebauer’s Pain Ease® is the instant topical anesthetic skin refrigerant cleared to temporarily control the pain associated with needle procedures and minor surgical procedures. 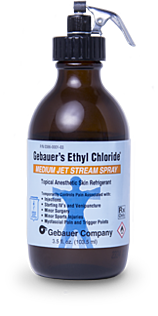 Gebauer’s Ethyl Chloride® is the world’s first instant topical anesthetic skin refrigerant is intended to temporarily control the pain associated with injections, IV starts, venipuncture, minor surgical procedures and the temporary relief of minor sports injuries. Published clinical trials support the use in children 3 years of age and older. Do not use on large areas of damaged skin, puncture wounds, animal bites or serious wounds. Do not spray in eyes. Over spraying may cause frostbite. Freezing may alter skin pigmentation. Use caution when using product on diabetics or persons with poor circulation. Apply only to intact oral mucous membranes. Do not use on genital mucous membranes. The thawing process may be painful and freezing may lower resistance to infection and delay healing. If skin irritation develops, discontinue use. CAUTION: Federal law restricts this device to sale by or on the order of a licensed healthcare practitioner. Published clinical trial results support the use in children 3 years of age and older. Ethyl chloride is FLAMMABLE and should never be used in the presence of an open flame or electrical cautery equipment. Inhalation should be avoided as it may produce narcotic and general anesthetic effects and may produce deep anesthesia, fatal coma or cardiac arrest. Do not spray in eyes. Over spraying may cause frostbite. Freezing may alter skin pigmentation. The thawing process may be painful, and freezing may lower resistance to infection and delay healing. Cutaneous sensitization may occur, but appears to be extremely rare. Long-term exposure may cause liver or kidney damage. CAUTION: Federal law restricts this device to sale by or on the order of a licensed healthcare practitioner.